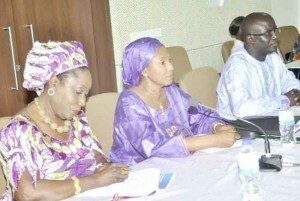 The chief executive officer (CEO) of The Gambia Investment and Exports Promotion Agency (GIEPA) has assured her institution’s committment to support the business community and institutions to make positive difference in peoples’ live. Presenting the institution’s activity report for the year ended 2013 before deputies of the joint session of the Public Accounts and Public Enterprises Committees (PAC/PEC) of the National Assembly on Wednesday, Fatou Mbenga-Jallow, outlined GIEPA’s corporate responsibility, while assuring that GIEPA is equally committed to support communities which work and live and are consistently looking for ways to provide support and encouragement to the business community and the environment it operates. “In 2013, the Agency supported many initiatives, their objective mainly is to gain maximum exposure to doing business outside of The Gambia,” she revealed. During the scrutiny session, the GIEPA boss pointed out that the Agency wanted an increase in its annual subvention so as to render more services. “We are doing a great job, but we can do more if there is more resources,” she assured lawmakers. The GIEPA CEO informed lawmakers that during the past few years, the Agency had also put some funds in its public relations budget to support businesses fund their travels to trade fairs and other event where they would be exposed to business opportunities. On project profiles, the GIEPA boss went on, as part of government’s PAGE, the Gambia has identified several priorities sectors including Fisheries and Information Communication Technology (ICT) as potential drivers of the economic growth development in the coming years. CEO Madam Mbenga-Jallow assured deputies that GIEPA would lead this facilitation of a consultancy, which she said will profile both sectors toward developing 10 to 15 specific project profiles to be promoted to the targeted investors in those sectors. Dilating on the private sector development strategy, the CEO further assured that GIEPA would lead efforts of developing a private sector development strategy for The Gambia through the support of The GCP. “The development of the strategy will be coordinated between the Ministry of Trade, GIEPA and The Gambia Chamber of Commerce and Industry,” she informed. She further assured lawmakers that GIEPA would focus on promoting and developing the export potential of businesses in the country. The national export strategy, she noted, has been prepared and agreed. She added that priority sectors for export promotion are already defined. GIEPA was rated by The Gambia Public Procurement Authority (GPPA) for 97% compliance on both their activity and financial reports and was adopted by deputies with unanimous vote.